Home » News » Great Dublin Bike Ride – Simply Soups Cycles for Charity! At Simply Soups we’ve a great bunch of people working for us who’re always looking to do their bit to get behind a great cause. 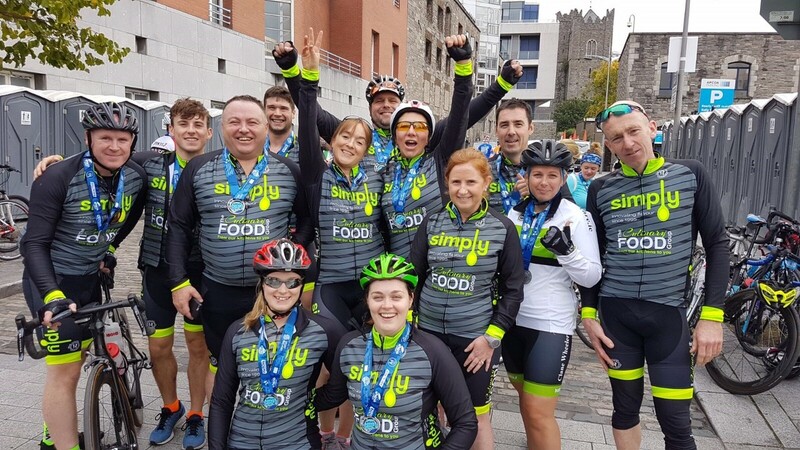 In July, 13 members of the Simply Soups team took it upon themselves to take part in the Great Dublin Bike Ride to raise much needed funds for Straight Ahead Ireland. The team raised almost €8,000 as a result of their training and fund-raising efforts, which is a fantastic achievement. A massive congratulations to everyone who got involved. Straight Ahead Ireland is a fantastic organisation that is largely run by volunteers and it was brilliant to support such a wonderful cause. The charity provides surgery, support and medical equipment to children with orthopaedic conditions and it is only able to do this with the donations that they receive. Launched in 2011, one of the Straight Ahead’s main aims is to identify and help time-critical patients that are in danger of deteriorating rapidly whilst on hospital waiting lists. Surgeons work for the charity on a pro-bono basis and are changing the lives of many children who wouldn’t be able to receive treatment without the help of Straight Ahead. Children with difficulties such as scoliosis and lime deformity are on long waiting lists to receive the help they need. The longer the children are made wait increases the damage caused by their conditions and also increases post-surgery recovery times. Many of the children would have to wait years for an operation and therefore the outcome would not be as successful as having the required operation sooner. To date 100 children have been operated on with many more waiting for the call as funds become available to pay for the more operations. If you would like to support this wonderful cause you can learn more here. Hats off to all the Simply Soups Cycling team – a top performance for the Great Dublin Bike Ride!! The race is split over two courses 100km or 60km. Whichever route you chose it’s no mean feat to cross the finish line, that’s for sure! Both routes were completely sold out this year and there was a fantastic atmosphere throughout the day. In the weeks leading up to the cycle our team of cyclists became really focused, urging each other to get that extra bit of training in during the evenings and weekends. There was a real togetherness among the team who wanted to go the distance on the day and do their best for the Straight Ahead. We’re all extremely proud of them for exceeding all expectations with some great finishing times. Now that the aches and pains have died off we’re on the lookout for our next challenge! We’ll definitely be getting back in the saddle for the Dublin Bike Ride next year. Many of the people taking part were raising money for charity and registrations are already open if you or your organisation would like to join us for the cycle next year? And remember if you’re training hard – nutrition is key! Check out our new Ready to Cook chicken meals at Aldi.